« As the Ancestors told us, we once were men. Living in the open savannah, in harmony with nature. Hunting with arrows, spears, tips made of stone. A nation always on the move. We knew the ways of the Veld. We knew the magic paths and tricks. We knew how to approach our prey unfelt. Never taking more than needed. Then the other people came. Carrying seeds in earthen pots. Out of the Forest they came. Protected by the spirits of the fiercest animals. And we were left naked. !Kau was he who rose. !Kau was the one who called all the Sākho'en. Under the moon of Tsai'Guab they bathed. In the great lake in the middle of the Rift. The great lake that the Rift opened. The holy lake whose waters shine green. The lake where the voices are so strong. That lake that used to be called Nam Lolwe. The name of Go-Garib they summoned. Go-Garib, the Beast on the edge of the Abyss. Thus we did, under the moon in the holy lake. Under the stare of the Great Apes who watch there. We became the beasts that we once hunted. We became the beasts that were hunted. We, hunters, became the hunted. The post was edited 3 times, last by Ghiznuk ( Mar 11th 2019, 2:45pm ). So this is the opening thread for our next Taphrian army, as part of the project « It's time for Africa ! ». This army is intended to be the African Beast Herds army. They mythology I wrote here above is intended to reflect how the native, primitive hunter-gatherers of Eastern and Southern Africa could have felt/reacted in the face of the Bantu « colonization » in the first millenium of our history. In our world where magic does not (officially) exist, those people were mostly assimilated into the new farmers/herders culture. They remain only in small scattered pockets here and there (various ultraminority ethnicities in Tanzania / Kenya) or in areas totally unsuited for the Bantu way of life (Kalahari desert). But what if magic had allowed them to transform and resist ? That's the basic concept here. Drawing very loosely on Khoikhoi mythology and names. Now, the current Beast Herds army I think is already pretty close to what we want to achieve. 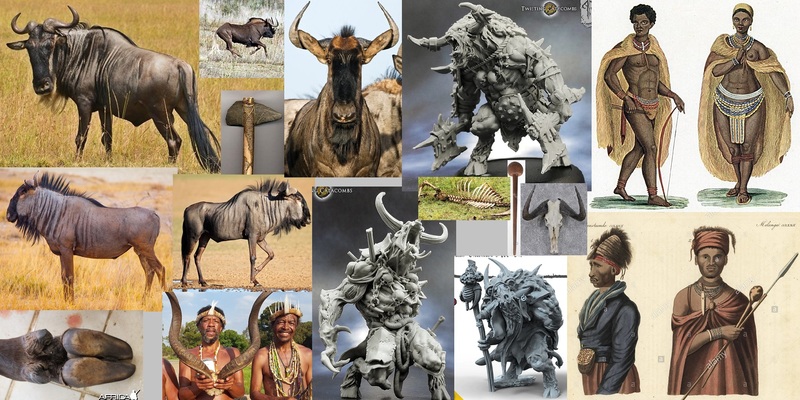 Except our Best-men have Wildebeest, Buffalo and Antilope heads instead of Goats and Bulls. But a few units and rules of the standard Beast Herds army are definitely forest-oriented. The obvious Strider (Forest), but also stuff such as the Briar Beast coming out of a forest, or the Giant taken trees to fight. So, let's brainstorm a bit ? Despite it is a personnal idea that perhaps cannot match with official background, it can give some ideas. Not a specialist but I heard that there was a millet based beer, no ? 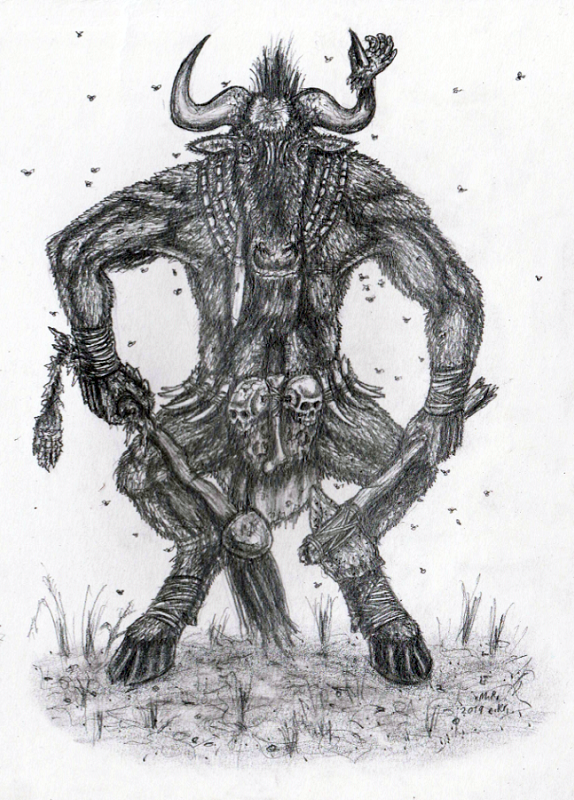 My concept of Taphrian Beast Herds are transformed Bushmen. Bushmen don't practice any form of agriculture at all. The reason why our Beast Herds became Beasts is exactly this, that they saw that as the only solution to preserve their hunter-gatherers, nomadic traditions, in the face of more technologically advanced Iron Age herders / farmers (the Vanhu). No agriculture means no cereals, means no beer. Likewise, they don't even have the technology to brew beer anyway (such as advanced pottery). Also, talking about the variety of beasts, we are rather limited. – Gnolls (Hyena-men) are part of the Vermin Anteater army. – Monkeys also already have their own army, the Mukumbusu Wrestling Apes. So what is left for Beast Herds is specifically Wildebeest, Buffalo, Antilopes, and so on. Note that we paid special attention to this while designing Vanhu, exactly so that the Vanhu would not have any ancestral spirit and related Shapeshifter that would overlap with the Beast Herds. T'was hard enough to fend off attempts to incorporate them in the Vanhu. those ancestor spirits remaining are Lion, Cheetah etc. This would give a common thread between Vanhu, the BH Taphrian faction and the VS Taphrian faction. Good material for us to explore in the future AB, where we would give the BH and VS version of how they had to leave their mother country. It fits also the RL idea of Bantu migration across Africa. This would mean to remove all Herd related animals, i.e. Buffalo, Wildebeest, Gazelle; and also to remove Hyenas. In the future, we will be glad we did remove them. We could also remove Elephants and Rhinos, as they have been included with Koghi. Still, Koghi does not consider them as ancestors, so we could also keep them. No mention anywhere of Beasts in Taphria, so we can assume that they are well hidden. They have no city in Vetia either. Kenya/Tanzania savannah, N’Gorongoro Crater and Okavango Delta. Kingdom of Luba and Lunda. Pretty much the whole AB can be used, except centaurs and probably most monsters. Warthogs replace hogs. Monsters can be replaced with elephants, buffalos and rhinos. All infantry could be made a bit more savage and dangerous than their Vetian counterparts. How intelligent are the Beast Herds? Are they purely driven by primal instincts or is there a grander plan for their herds? Are minotaurs just big wildhorns, or do they have their own tribes and agendas? In the current day, the herds are found on every continent, and contest those lands with their other inhabitants. The herds are diverse in culture and appearance across the world. Of the two general types of herds, the warherds are led by bestial chieftains. They are autocratic but prone to leadership challenges - sometimes resulting in the death of chief or challenger. Leaders gain favour if they demonstrate martial prowess and accumulate great stories told about them. While minotaurs sometimes have their own tribes, most times they are found living in and with the other beasts of the herds. Like all tribal peoples, individual tribes have their own goals, agendas, and concerns. The question of the intelligence of beast-men is a harder one to address, for while the beasts all have similar intellect to humans, their behaviours are governed by their nature differently than that of human people. Beast-men are quicker to violence than humans, and less likely to use missiles because of reasons of biology more than any condition of intellect. That said, it would be a mistake to disregard them as mere creatures of instinct, the beasts and their leaders are very cunning and discerning. It is said that wherever a human explorer goes in this world, a beast has been already. Even in this great ninth age of humanity, the herds can be found around the world in all their dizzying diversity and savagery. Even in Vetia, they have not been entirely stamped out, with small bands still encountered in the wild parts of the great nations. Because they are cheap and deniable, many are still employed by statesmen as mercenaries - despite the risk to reputation, and knowing full well that the horned ones’ untamed nature makes them a double edged sword once unleashed. Tales of much larger forces gathering in the eastern bogs are known to all. Claims of titanic herds of untold numbers roaming the uncharted regions of Taphria or Silexia are less easily verified. Title: The Beast (Beest?) Herds from the Veld. Or do we go for some kind of Khoisan imitation? Fluffwise, I like a lot the idea that they were the ones who refused the evolution towards agriculture, and kept intact the traditions of hunter-gatherer (focusing on the gatherer side). They assemble in immense hordes, which keep nomadizing across wide paths of land. They could be the herders of feral cattle, which they don't eat, they just protect. They resist modernity. Do they even have any chariot? They use magic, force and number to resist all the invaders. And they are worried that in addition to the traditional enmity against the Vanhu who kill animals, there are recent invaders with white skin and firearms and respect nothing - and don't understand their language with clicks, and pretend that the land is empty for them to colonize. I was thinking about the clicks. Those Herds could actually live everywhere in Taphria, not just in the Veld. They would just be more numerous in the Veld. It could be a place that Vanhu tend to avoid. At the same time as offering an exciting wide « empty land » for Imperial settlers. I'm happy with Khoisan words, as long as unit names are intelligible and those words are kept in the fluff under the unit entry. I don't think Chariot. Let's apply the same principle that we took for the Vermin Anteaters : less constructs, more beasts. They could have more spears and more (poisoned) bows, as those are the traditional weapons of the Khoisan. I would have them hunt. They are carnivorous. Have them herding cattle, means they could as well have kept their humanity and let Vanhu culture assimilate them. 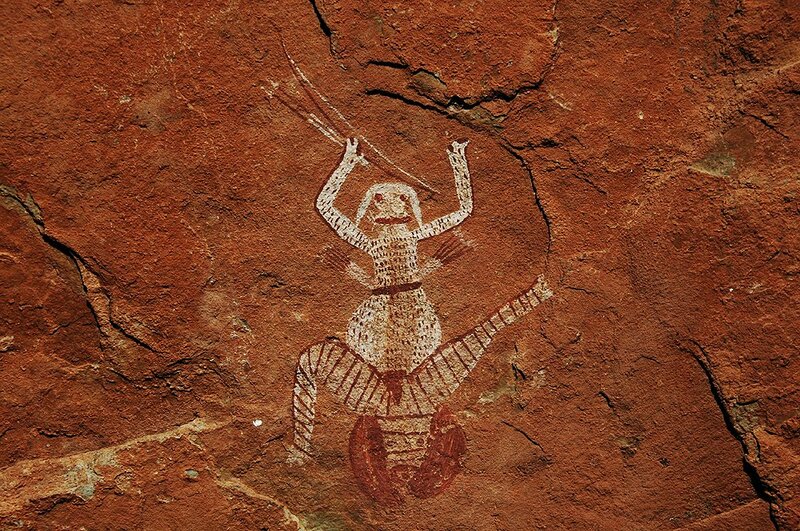 Oh, and they do love their rock-paintings, even more than Vetian Herds love their statues. This is a marvellous concept, @Ghiznuk! Matched by a quality introduction post. I've been pondering how Bantu migration history could translate to fantasy, and this native response to the iron-wielding conquerors is top-notch historical resonance in fantasy: Become the beast. Beastmen is the Warhammer faction I've least of all read up on and tinkered with in story concepts, so I'll probably have to listen in on this brainstorming from the sidelines and take notes. Thank you very much for this amazing piece of artwork ! Was thinking – this army should include African Wild Dogs, the animal we call in French « Lycaon ». I've been fascinated by them since childhood. They could be same as standard dogs from the BH army, but instead of Guide they are faster, get Pack Tactics and Vanguard. I realized that Beasts dominated the Third Age (along with Orcs) and were still prevalent during the Fourth and Sixth Ages. The 4th and 6th Ages can easily be explained by remnants from the 3rd. But where did the Beasts from the 3rd Age come from? And what is the link with the Beasts in Taphria, if any? This is what I try to speculate about hereafter. I will now concentrate on the oldest times. In the 2nd Age, Dwarves controlled the Mountains of the Moon as their main hold, were strong in Taphria and were dominant in Vetia (leaving room for Men and SE). No mention of Beasts, which means that they were below noticeable size in Vetia. Also, Naptaan Kingdoms were formed during the 2nd Age, and ruled most of the Middle Sea, preventing any movement of warlike tribes across it. I understand that Naptaan split the Dwarves between those living in Vetia and those living in Taphria. Then, 3rd Age starts with Beasts ravaging everyone. Where do they come from? Simultaneously, Naptaan falls to internal treason, and becomes UD. This last even may be the solution allowing briefly Beasts to invade Vetia, coming from Taphria. At the time, the Great Desert may not have been Desert yet (like Sahara which was green a few millennia ago), it would become sandy desert only after the Naptaans would have been cursed. During 2nd Age, Beasts populate most of Taphria, including the future Great Desert, green at that time. Dwarves control the Mountains of the Moon in the east. Naptaan kingdoms rise and control the northern shores of Taphria. SA live in the deep forests, still paralyzed by their recent civilization destruction at the end of the 1st Age. Suddenly, Naptaan collapses because of Setesh and the ensuing civil war and curse. Within few years, the Great Desert ceases to be green and starts to become a desert. Forced to migrate and having a sudden gate opening in the north-east, many hordes of Beasts rush north-east, where there is no more Naptaan and not yet UD to stop them. At that time, there is no ID neither to block them, and Avras is not built. With nobody stopping them, they invade Vetia where they cause havoc. The minority of BH remaining in Taphria, who were the most attached to their ancestral's lands, have to leave the now desertic Great Desert. They don't settle neither in the Dwarven mountains nor in the Saurian's rainforest, but move south in-between. They are now mostly found in the plains and moderate hills in south Taphria. Never again would BH from Taphria leave that continent, the branches are now separated forever. The events related in post #1 above would have happened in the early 9th Age, which is still many centuries ago, but the oral memories would not recall much beyond anyway. This is when Taphrian BH would feel the pressure from colonizers. However, this time, they are trapped, blocked in all directions either by the sea or by stronger civilizations. They have to face the invaders or die. Why not incorporate Smokeleaf, Tabacco, Weeds of sorts, or some kind of naturally sourced intoxicant instead of beer to relate to the same-similar rules? @Calisson, I appreciate your contribution but find it really far-fetched. Also, I'm sure the BG team has already a decent explanation on where the Beast Herds come from. I'm not sure that your story fits in. Also, in the story in post 1, I'm talking of a human people who became beasts through a magical ritual, in the beginning of the Ninth Age. So they can't be linked to the Beasts of the Third Age. @Giladis since you're back, could we have any hint at where the Vetian Beast Herds came from, to ensure we don't start making up too many things here ?